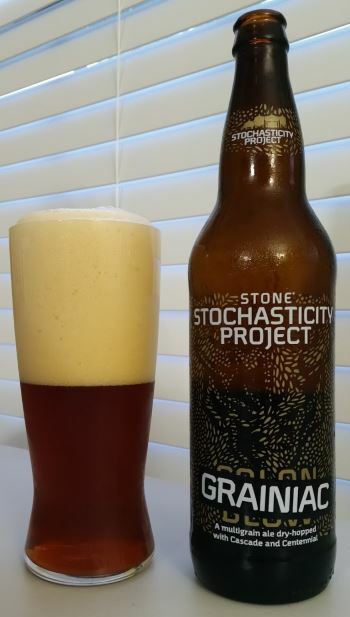 Grainiac is another experiment from Stone’s Stochasticity Project line, and this time it’s a hopped-up malt bomb. The head is massive and silky and hangs around like you would expect from a root beer float. The nose has toast and granola and just a hint of lemon. 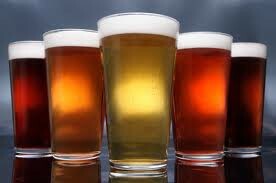 The middle is full of sweet grain, and bitter hops. There’s sweet orange notes bitter pine, and a strong whole-wheat breadiness. More like dough than baked bread in flavor. The finish is sugary with a tiny herbal bitter bite right at the very end. The body is medium to heavy, and the alcohol is a fairly stout 8.5% ABV. The grains in this beer (barley, wheat, rye, triticale, millet and buckwheat) make it interesting, but Stone makes it special. This entry was posted in Reviews and tagged Ale, Amber Ale, American Amber Ale, California, Imperial Amber Ale, Stochasticity, Stone on May 3, 2016 by Xander.